Due to my Triathlon enthusiasm in past year, I've got into swimming also. As to my nature, I have to get to know the technical jargon about swimming, that I would be able to learn to swim smoothly. For that purpose I found a perfect book, 300 pages about freestyle swimming - Swim Smooth: The Complete Coaching System for Swimmers and Triathletes. 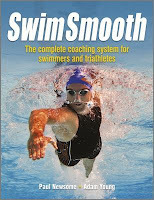 Swim Smooth is book by Paul Newsome and Adam Young, both have a long background on swimming, but even more background on coaching swimming. They have a Swim Smooth named swimming training center in Australia and very useful web page also about swimming. I must admit, that I thought there can't be written 300 pages about freestyle swimming so, that every page would make sense, but I was so wrong. Book is filled with good information, training tips, technique and useful pictures explaining all the things in detail. When reaching to the end of the book, I even thought it fell bit short. Book starts from the basics of swimming and explains every part of swimming in great detail. For training purposes, book introduces 6 different swimmer types and give tips on improving swimming to all of those. It also says that there is no one best way to swim, it's always about the body and personal preferences. If you are on to improving your freestyle swimming or into triathlon, this is a must read book. It stops the speculation on what is good and what is not for swimming and gives statistics and technique advices to all aspects of swimming. It has even its own section to open water swimming. Only minus I have to give the book is that it became expensive to me. I have ordered swimming training equipment with about 100 euros only due to this book. I believe those will pay back to me on better swimming training sessions and eventually as a better swimmer in next triathlon races. For freestyle swimming, this book is my bible now. I'm not going to look for any other book or training sites for a long time. Price of the coding - is it a nationality issue? Couple of weeks ago Finnish magazine 3T got their hands on secret internal report from an large Finnish company about efficiency of coders in different countries. Report stated that even though Indian coders cost approximately 30% of what Finnish coders do, Finnish ones are 4,5 times more efficient than their Indian counterparts. This then means that Indian coders turn to be 35% more costly than Finns eventually. (Source: (in Finnish) 3T - Salainen selvitys: Intialainen koodaus on suomalaista kalliimpaa). I've worked with at least, Finnish, Indian, Chinese, Russian, Polish, Turkish, Slovakian, British, French, Mexican, US and Canadian coders and I have to say nationality doesn't make a difference. Despite the nationality there are really efficient coders and coders who just can't make it happen. There are noticeable national differences on work methods, but those don't explain the efficiency. Trend in buying coding from some specific country drives to the situation, that there are too much demand for the knowledgeable resources. In these countries some less capable people do get hired and easily sold to high demand customers in countries where coding prices are high. This might make it look like coders in some countries are less capable than in others. In countries where price of coding is higher, only the efficient ones get to keep their jobs. When the competition is fierce, less capable ones turn to do something else than coding (I bet many of you think managing of the coding now). I like to believe that, in most of the cases price of the coder is irrelevant. Good coder can easily be 100 times more efficient than some other. I don't mean they make code 100 faster than others, but they can make much more clear code and create much less errors than others. So the overall result might be 100 times less work was done for some piece of software. Also a good team can make a difference. Team with good internal ways of working, like code conventions, code review practices, architectural guidelines and open discussions will improve efficiency dramatically. These in their own sense make evaluation of SW project length a challenge. It's the team and following their efficiency that make it possible to estimate what's the cost and time of certain SW project. There are noticeable differences in efficiency of certain coders and team of coders. I don't believe it's a nationality issue, it's always about how competent the individual and the team is. It doesn't make buying of SW development easy. What it should state to the buyers though, is that price is small function in SW development efficiency. There always need to be other measurements in use, to know the real price of the coder and the team. Zenrobotics is a Finnish company, who have invented really important product. They've made a robot that can identify and collect different materials from trash and this way improve recycling a lot. Their product is cool and meaningfull, but what I love the most, is their marketing videos. This is a perfect example of an extremely enjoyable marketing video, where still the product plays a key part. There's many entertaining product videos and adverts out there, but too often the actual product doesn't really play a part on it. In this one, the robot plays a key part. There's Finnish proverb (Kissa kiitoksella elää) which translates to a "Cat lives with a thank you". And to be a Finnish proverb, it is actually a cynical one, stating that it's only the cats who live with a thank you and people need a lot more. This proverb, or saying as we Finns call these, came to my mind when I visiting a potential customer few weeks ago. It was so called cold meeting, where a guy had promised to see us to hear more about offering. In the very beginning the guy started to tell who well our productization has been done. He really praised our productization so much, that I, as a humble Finn, didn't want to say I had made most of it. That episode though was something that motivated me for many weeks. The thing I had worked for several weeks or months paid of and I got a thank you from someone, who had no motivation what so ever to flatter me. This reminded me once more, that you can never tell too much about the thing you appreciate. It so easy to complain about things, but it's always harder to say thanks to the ones who would earn it. I promise to give more positive feedback in the future. It helped my motivation for many weeks. Maybe it helps someone else too. 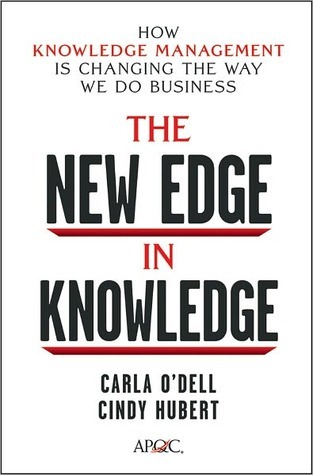 I read The New Edge in Knowledge: How Knowledge Management Is Changing the Way We Do Business. This was a book I purchased to understand knowledge management possibilities in our client companies. So it was purely out of professional interest about the subject. After reading the book, knowledge management feels more of a bureaucratic nonsense than it did before the book. It introduced knowledge management to require lot of efforts and big organization to get it working. I just have to disagree with that. Big part of the book was explaining the obvious of knowledge management. There wasn't really anything innovative presented for knowledge management, tools and processes were common and common sense. Examples presented in the book was from big companies, I don't consider really leading edge of any sort. Those were big successfull companies, which I believe have all the methodologies of the world in use and succeed despite those. I didn't find any actual proof, that knowledge management would have really made these companies special. I do believe knowledge management and learning organizations are important. I disagree the bureaucratic, comprehensive programs build to increase knowledge sharing. Knowledge sharing comes from open atmosphere and good enough tools for it. As a final touch, style of the book couldn't be considered as exhilarating or inspiring. It could have easily been 50 pages shorter than it was. I can't really recommend it to anyone. There must be better books for knowledge management.